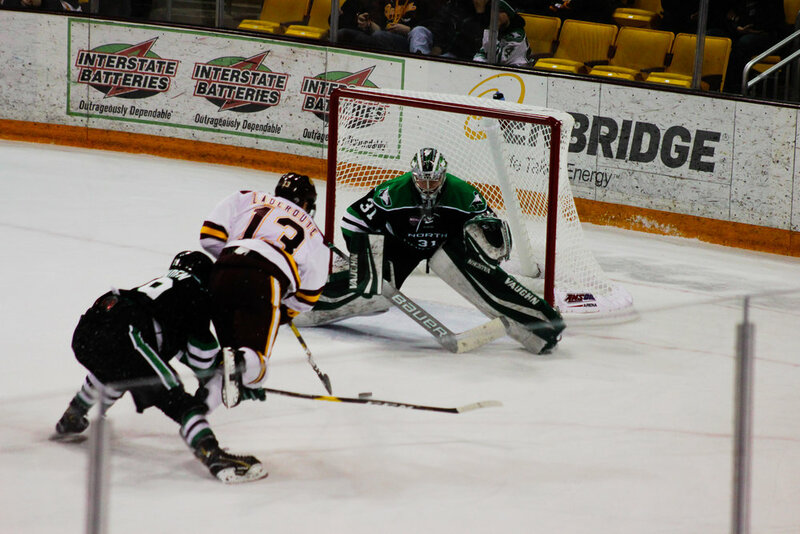 The Bulldogs were coming into tonight's game with a nine-game winning streak at home before it squared off in the second game of the weekend versus the North Dakota Fighting Hawks. The Bulldogs were punched in the mouth early, allowing two goals a minute apart. UND sophomore Jordan Kawaguchi scored the first goal for North Dakota, but was later ejected following a spearing call and given a 10-minute game misconduct late in the first period. Kawaguchi was on his way to having a fine game. He set up other sophomore Grant Mismach right in front of the net for an easy second goal. The Bulldogs answered midway in the first after freshman Tanner Laderoute scored off the rebound from a shot by fellow freshman Jackson Cates. The physicality carried over into this game, with both teams staying aggressive with each other. Both teams combined for 27 penalty minutes in the first period alone. The second period was also a test for the Bulldogs penalty kill, which ranks second in the NCAA behind St. Cloud State. The team accounted for four penalties and 21 more penalty minutes, including having to kill nine straight. Even with all the penalty minutes, North Dakota could not find the net in the second period. Thunderous boo’s from Bulldog fans would rain down after every call that would go against them. Goalie Hunter Shepard had a big game and a good second period. Shepard recoded 15 of his 28 saves in the period. In need of a goal in the final period, the Bulldogs rally came up short. Minnesota-Duluth pulled Shepard with 1:31 left, but just could not find the net. We’ll have to wait till next weekend for Sandelin to become the winningest coach in school history, he is tied with Mike Sertich with 350 wins. Sandelin will get his chance next weekend when the Bulldogs travel to Kalamazoo, Mich. to take on the Western Michigan Broncos.